The Sunday bird walk went to Legacy Marsh in upper Lantzville. The morning was sunny with calm winds. We saw two Townsend’s Warblers feeding in a tall Big Leaf Maple Tree just off the trail. A Wilson’s Snipe was spotted near the marsh. A Red-breasted Sapsucker was seen in a conifer tree just off the trail giving us great views. 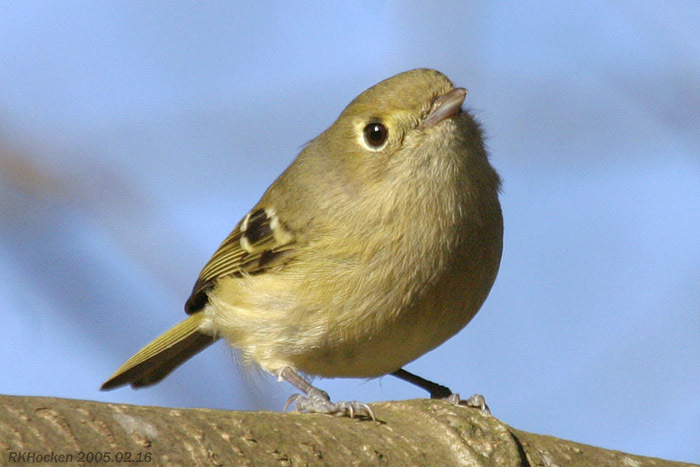 We heard a Hutton’s Vireo and then spotted him. Orange-crowned Warblers, Common Yellowthroat and Yellow-rumped Warblers were heard and seen all morning. A Rufous Hummingbird was perched in a short bush for a long period of time giving us great views. Turkey Vultures, a Bald Eagle and a Cooper’s Hawk were seen high overhead during the walk. Two Evening Grosbeaks were seen along Avonlea Road and Cavendish Road in Nanaimo. Four Ruddy Ducks were seen at Pilot Bay, Twin Beach on Gabriola Island. The Tuesday bird walk went to the Shelly Road side of the Englishman River in Parksville. The morning was cloudy with calm winds. A Hermit Thrush was spotted just off the trail. A Trumpeter Swan and three Canada Geese were seen along the river. 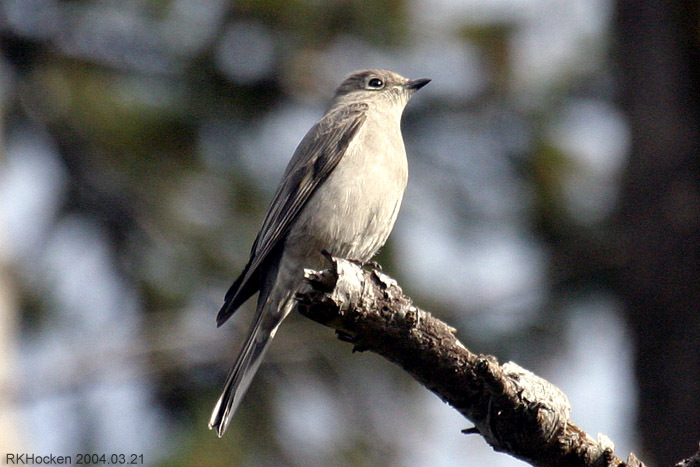 Two Townsend’s Solitaires were seen perched in a berry bush not far from the trail. A Sharp-shinned Hawk was seen high up in a tall tree. White-crowned Sparrows and Golden-crowned Sparrows were heard singing all morning. 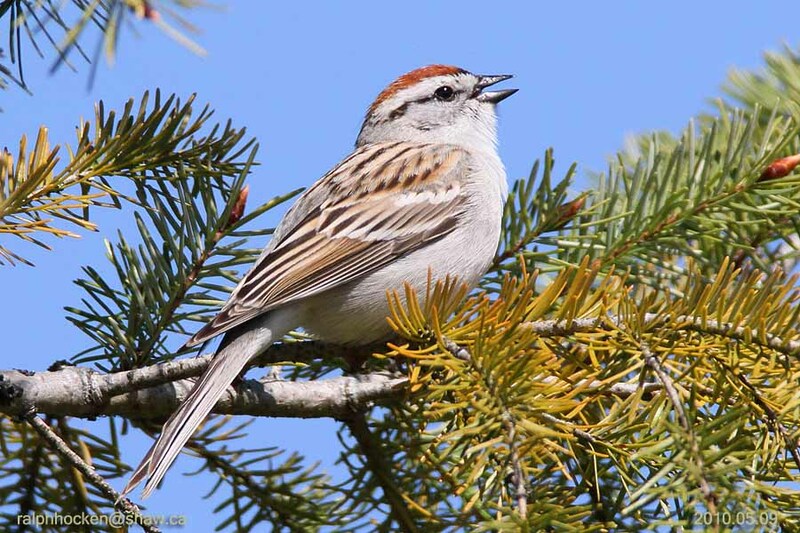 A Chipping Sparrow was spotted just off the trail. We watched a Lincoln’s Sparrow preening itself in a bush near the trail. A Barred Owl was perched next to the trail giving us great views. 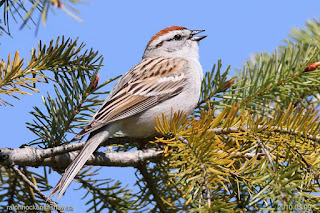 Chipping Sparrow: Ralph Hocken Photo. An American Goldfinch was seen on Protection Island. A Black-headed Grosbeak was seen at a backyard feeder near Tempre Road and Pry Road in Parksville. An American Goldfinch was seen Along Lancewood Road in Lantzville. A Rufous Hummingbird was seen in a backyard feeder in the 3300 block of Barrington Road in Nanaimo. The Tuesday Bird Walk on April 24, 2018 will be going to the Plummer Road side of the Englishman River in Parksville. Meet at the Parksville Community Park (near the Lions Club playground parking lot) in Parksville at 9:00 am, or at the corner of Plummer Road and Shorewood Drive on the oceanside of Highway 19a at about 9:10 am. The Sunday Bird Walk on April 29, 2018 will be going to Morrell Wildlife Sanctuary in Nanaimo. Meet at the Bird store at 9:00 am or at parking lot at Morrell Sanctuary at 787 Nanaimo Lakes Road in Nanaimo at 9:20 am.